Gilles Simeoni, right, is congratulated by newly elected President of the Corsican Assembly Jean-Guy Talamoni as he celebrates after being elected president of the Corsican Executive Council in the Corsican Assembly in Ajaccio, on the French Mediterranean island of Corsica, Jan. 2, 2018. Corsican nationalists seeking greater freedoms for the French island were sworn in as its leaders Tuesday, setting the stage for a potential standoff with Paris, which has given short shrift to their demands. The nationalists, who have governed the island of 330,000 people for the past two years, achieved their best-ever performance in December's regional election. The Pe a Corsica (For Corsica) alliance won two-thirds of the seats in a new regional assembly, a result which it said gave it a strong mandate to pursue a campaign for more autonomy from the highly centralized French state. The election coincided with a failed bid by Catalan nationalists to break away from Spain, but Corsica's leaders have assured they are not seeking independence for the time being. Separatist leader Jean-Guy Talamoni, who was sworn in as assembly president, paid tribute Tuesday to the National Liberation Front of Corsica (FLNC), which ended a four-decade insurgency in 2014 to give space to the political process. Talamoni, who heads the smaller of the two parties in the governing alliance, praised the outlawed FLNC "for defending the Corsican people at a time when there was no democracy in this land." Gilles Simeoni, a moderate nationalist who stops short at calling for full independence for the island, will head the new executive. Corsica, famed for having some of the best beaches in Europe and for being the birthplace of Napoleon, was once a hotbed of violent anti-French militancy, but in recent years has been more stable. The nationalists' main demands are that the Corsican language be given the same status as French; that jailed Corsican nationalists be granted amnesty; and that people from other parts of France be restricted from buying property on the holiday island. FILE - French President Emmanuel Macron arrives to attend the EU summit in Brussels, Belgium, Dec. 14, 2017. 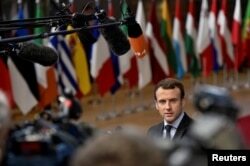 President Emmanuel Macron has insisted he is open to dialogue but ruled out making any changes to the constitution, effectively rejecting the nationalists' demand for special status for the territory. On Friday, the government's special envoy to the region, Jacqueline Gourault, will travel to the island for talks. The minister, known as "Mrs. Corsica," told AFP on Tuesday: "Dialogue starts with listening: My trip is a recognition of this new authority and its elected representatives. "It is also a stepping stone in the preparation of the meeting scheduled for January between the prime minister and the Corsican representatives." The FLNC repeatedly targeted state infrastructure over the course of a four-decade bombing campaign. But opinion polls show that most Corsicans, many of whom live off tourism or are employed in the public sector, want to remain in France. Even Talamoni — nicknamed by some the Corsican Puigdemont after the Catalan leader — has said the island would split from France in 10 or 15 years at the earliest, if a majority supported it. Talamoni has threatened to organize protests if the French government does not make concessions.